Questions about gender, justice and crime are constantly in the public arena, whether they focus on young women getting drunk or taking drugs, or the rising numbers of women going to prison or committing violent crimes, or reports of macho behaviour on the part of men in the military, law enforcement or professional sport. 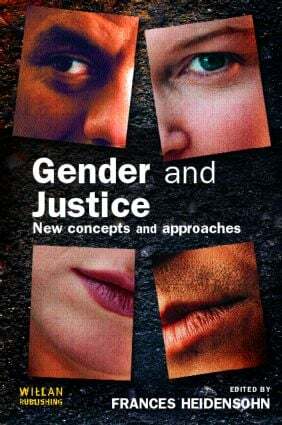 This book provides a key text for students seeking to understand feminist and gendered perspectives on criminology and criminal justice, bringing together the most innovative research and work which has taken the study of the relationship between gender and justice into the twenty-first century. The book addresses many of the issues of concern to the established feminist agenda (such as the gender gap, equity in the criminal justice system, penal regimes and their impact on women), but also shows the ways in which these themes have been extended, reinterpreted and answered in new and distinctive ways. Organised into sections on gender and offending behaviour, gender and the criminal justice system, and new concepts and approaches, Gender and Justice: new concepts and approaches will be essential reading for students taking courses in criminology and criminal justice, and anybody else wishing to understand the complex and changing relationship between gender and justice. A gendered Irish experiment: grounds for optimism?